HomePlan Designs is currently in the process of redesigning a rundown, outdated, 60’s style house. When the project is complete, it will fully complement the surrounding properties. 3D Design Rendering of the Remodel by Lancashire Architectural Consultant Chris Sinkinson of Homeplan Designs. Rundown houses are often the point of speculation and local discussion. People wonder what these neglected structures once looked like and what they could become if they were restored. Sometimes these houses do get a second chance when they are re-visualized and remodeled by an architectural design specialist, who has the skills necessary to restore them to prime condition. That is exactly what Lytham, Lancashire Architectural Consultant Chris Sinkinson, has set out to do. The current house he is redesigning is in a poor state of repair and looks out of place, sandwiched between a grand old Victorian home and a well-appointed large detached traditional brick residence. Chris and his client believe there is a lot of potential in this property, though. This is what Chris had to say about the job, “It’s great to get your teeth into a project that stretches your imagination. This one has truly been quite special in that I am turning an old house into a stunning contemporary home for my clients. As well as the extensions to increase the size, we are including lots of energy saving products to make this home very cost effective with its future utility bills.” Chris has been successfully redesigning and remodeling homes for over 30 years. 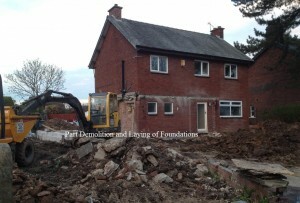 He maintains a very busy practice offering building design services in Lytham, Lancashire. The house that he is currently working on was built in the 60’s and the earlier remodel it received in the 80’s left it with a strange and unworkable layout because it was done in a very piecemeal fashion. Before the new design work was undertaken the property looked very dated and neglected. All of this made the house very noticeable in the street scene. When compared to the adjacent well-kept properties it can truly be said that it had seen better days. Chris Sinkinson knows that when the project is complete the property value of all the houses on the street will increase in value. MSN reported in a recent article that an unkempt house brings down the value of neighboring homes. The new owner will not have to worry about this when the remodel is finished. The initial building part of the remodel, which includes demolition of part of the older extensions, has already started. So far the foundations have been dug and the concrete has been poured for all of the extensions and the new swimming pool. The new owners are extremely pleased to have found the best Architectural Consultant in the area to design the remodel for their home. 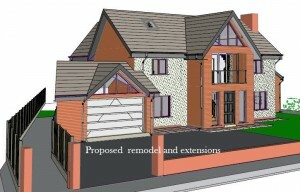 When the building project is finished it will have a modern contemporary look. They are significantly increasing the building footprint by adding a new enclosed swimming pool and gymnasium to the property. Chris has designed the complete house remodel to include several extensions such as a large garage and a new floor level built into the roof space. The swimming pool itself will be built tight against one of the pool enclosure side walls. For this reason the foundation for this wall will be formed as a deep trench with a single pour or ‘dry mix’ reinforced, waterproof concrete. When this ‘pool room’ is complete it will be a large open vaulted space with the roof formed using scissor truss rafters. The ceiling of this roof will be covered with cedar boarding. The side wall onto the garden will have very efficient double glazed bi-fold sliding doors, as will the new ‘Orangery’ extension. The roof will be covered with an array of solar panels, which will help to heat this area and the pool itself. The pool will be 1.5 meters deep over its full area. All in all, this area of the house will be a place where the family can exercise and relax after a stressful day at work. The transformation process of this project is absolutely amazing. Although they are working fast, Chris and the building team still have much to do. It will be great to see this house looking just as beautiful as the neighboring houses around it. 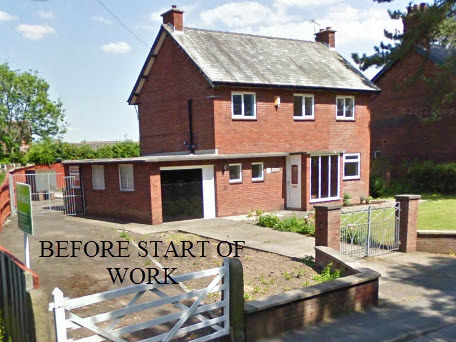 Lancashire House Before Architect Consultant Chris Sinkinson Began Working with It.